SEBASTIAN – Hurricane Matthew is expected to be off the coast of Sebastian early Friday with winds up to 130 mph. However, the widespread panic in Indian River County has emptied the shelves of water at Walmart in Sebastian. It seems all the 1-gallon containers of water disappeared. The store is currently restocking the shelves. Hurricane Matthew is currently 280 miles southwest of Port Au Prince, Haiti with maximum sustained winds of 130 mph. The storm is moving to the north at 6 mph. 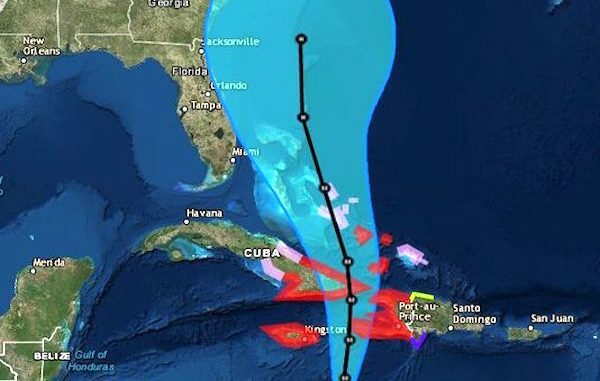 The National Hurricane Center cautioned the current path could vary widely as the hurricane moves from Haiti and Cuba, where warnings are in effect. The hurricane’s projected path has the center passing 180 miles east of Sebastian about 2 a.m. Friday. Forecasters say the storm will diminish to a Category 2 hurricane with 110 mph winds. The National Weather Service is predicting wind gusts up to 30 mph Thursday night and during Friday as the storm moves north. However, forecasters warn that tropical storm conditions are still likely in Sebastian. There could be coastal erosion, wind squalls, and rain bands.